Is a hamburger considered a sandwich? He wasn't sure how to solve the CAPTCHA, so he asked me: Are hamburgers considered sandwiches? Well, I couldn't figure it out, so I'm asking here! A hamburger (also called a beef burger, hamburger sandwich, burger or hamburg) is a sandwich consisting of one or more cooked patties of ground meat, usually beef, placed inside a sliced bun. Also on offer are hamburgers, sandwiches, and salads. And this seems to imply that hamburgers and sandwiches are different things. So I'm not sure I can take Wikipedia's word on this one. Since I didn't know how to respond to the question, I brought it up in EL&U chat, where different people put forth different arguments. It was even suggested that the American English / British English difference might be relevant. But so far I don't think we've come to a conclusion, so I decided to ask on the main site. I'm not sure what to think. All I have is speculation. Maybe hamburgers were once considered sandwiches by everyone, but now the terms are diverging and speakers have started to disagree. Or maybe it just depends on where you're from. Or maybe hamburgers exist in an interdeterminate state of quasi-sandwichhood. Is a hamburger a sandwich? No... I mean ... Yes ... I mean ... It's complicated. Technically, of course a hamburger is a sandwich, by looking at a dictionary definition. Or to be pedantic (and give prelude to the complication), those things called 'hamburger' include all those properties that are defined and given the label 'sandwich'. But what something 'is' and what something is 'called' and what its 'name' is (as Lewis Carroll said) are not (not necessarily) the same. But that's almost too technical itself. A peanut is not a nut. A cardinal is a bird but doesn't have to have bird in its name to be a bird. A penguin is a bird even though many definitions of bird include 'flying'. Birds are now known to be dinosaurs, but that is a recent discovery (just like how at one time whales were considered fish). The thing about 'technically', we don't normally use words that way. Is a cucumber a vegetable or a fruit? It's certainly a vegetable, formally or informally. But is it a fruit? It's not put in the fruit section with the apples and oranges and watermelon (when technically it is closely related to watermelon). No, a cucumber is considered a vegetable because it is green and not sweet, a lot like lettuce and celery. Back to hamburger. So technically, yes, a hamburger is a sandwich, a very particular kind of sandwich. It has a lot of things unlike most sandwiches (a hot, grilled layer; a bun rather than sliced bread). But, informally, it just doesn't seem like a sandwich. A BLT or chicken salad sandwich or corned beef on rye (mustard, no mayo) or even a grilled cheese all look like a usual sandwich. But a hamburger does not. There are many things about a hamburger (how it is prepared, where you can buy one, cultural associations) that are just not like a canonical sandwich. So technically, yes, a hamburger is a kind of sandwich. But if you did not include #5, the picture of a hamburger, in your answers, I'd say you're more like a human, and the robot would have included #5 because it is simple-mindedly rule based. Any item consisting of a filling served between 2 pieces of bread is a sandwich. hamburger: a sandwich consisting of a cooked patty of ground or chopped beef, usually in a roll or bun, variously garnished. The Hamburger is such a common sandwich that it no longer needs to have the word "sandwich" specified; it qualifies as its own sub-class. 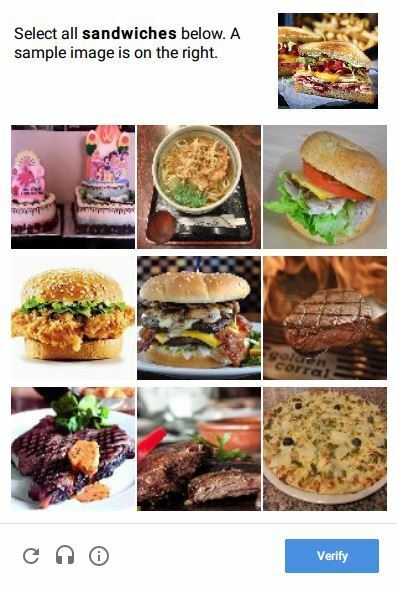 If I were presented with that CAPTCHA, I'd select items 3, 4, and 5 as sandwiches. As noted in comments, burgers are a sub-category of sandwiches, which is why menus often list them separately - listing only sandwiches does not necessarily connote that they serve burgers, and listing only burgers does not connote that they serve non-burger sandwiches. A New York Supreme Court judge has ruled that a hamburger is a sandwich. "Defendant's narrow viewpoint that a 'hamburger is a hamburger' and not a sandwich is only true where a person would order 'beef ground' without the bread," Justice William Underwood wrote in a 12-page decision released June 12. Today, it is not usually called a sandwich but I usually hear it called (or I call it) a sandwich in fast-food restaurants when you want to buy just the sandwich instead of a meal. However, you can call it a burger also. A familiar shortening of Hamburger n. Also used as a terminal element, e.g. in beefburger, porkburger, etc., usu. denoting a roll, sandwich, etc., containing the foodstuff specified in the first element. orig. U.S.
She held a pair of..gloves in one hand and a hamburger sandwich in the other. To start the thing off right, I ate a hamburger sandwich, carefully eliminating the gravel and other foreign substances as I came to them. I'll take the roundabout way of answering. Is a tomato a fruit or a vegetable? The answer is different depending on if you're asking botanically (a fruit) or culinarily (a vegetable). The same is true for other fruits as well, such as a cucumber. A peanut is culinarily nut, but botanically it is a legume (related to peas and beans). Likewise, a hamburger is culinarily different from a sandwich - you'll see it listed separately on menus and it's often referred to differently, especially when there are other sandwich options - but it's still a sandwich. When I'm ordering a burger from a fast food place, they'll often say "do you want the combo, or just the sandwich". So it is referred to that way in specific circumstances. I am a native British English speaker. When I first entered a Macdonalds I noticed that they referred to their hamburgers etc as "sandwiches". That usage jarred in my mind. For that reason (which I will explain further) I would say that in British English usage a hamburger is not a sandwich. In my dialect, the core idea of a sandwich is something placed between two slices of bread. The core idea of a "hamburger" is either a shaped item of meat, or the same placed between two parts of a bread roll (what an American would call a "bun" I suspect). 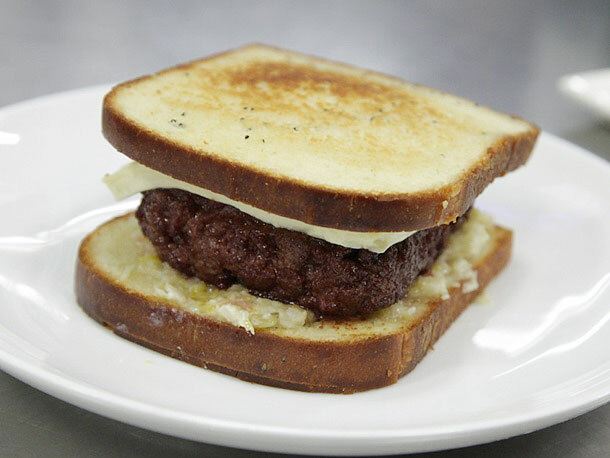 A "hamburger sandwich" would be a hamburger placed between slices of bread. Of course the verb "sandwich" has a much wider sense and does not require the involvement of bread and a hamburger is indeed sandwiches between Macdonalds' "buns", but being sandwiched and being a sandwich aren't the same thing. At least one commenter has indicated that they too find this usage odd, so in British English I would avoid using "sandwich" to refer to anything other than something made with sliced bread (as one assumes, possibly wrongly, the Earl of Sandwich would have used). A hamburger is a sub-category of sandwich. Like a square is a rectangle but a rectangle isn't necessarily a square, a hamburger is a sandwich but a sandwich isn't necessarily a hamburger. but then when you get bacon involved, it gets more complicated. I think time of day also affects the naming convention. If it's before ten a.m., I think you'd call it a breakfast sandwich without egg, but for the rest of the day, from what I understand, I'd call it a hamburger. Since this is a language site and not a semantics, ontology, or classification site, we need only think about it in terms of how languages work. And remember, language doesn't really go in for such mundane concepts as logic or historical accuracy. In the United States of America a hamburger is most definitely considered to be a kind of sandwich. The same item with chicken instead of beef will typically be called a "chicken sandwich" in America. In Australia a hamburger is one kind of burger. Burgers are not seen as a kind of sandwich by Australians. Other kinds of burgers exist, such as chicken burgers, even though a hamburger typically does not contain ham. Another thing is what would we call the meat part on its own? Some people do indeed also call that a hamburger, but when it gets confusing we'd usually say hamburger patty if it's destined to be served in a hamburger. But if it's going to be served on a plate accompanied by veggies to be eaten with a knife and fork, then it's a rissole! To the Aussie mind a burger comes on a bun and has cooked ingredients. A sandwich comes on bread which is typically sliced bread. In fact we don't call it as a sandwich if it comes on a bun no matter what is in it. In this case we would call it a roll. For instance a salad roll. We would understand that such a salad roll is more or less kind of a sandwich, but a burger is just too different. So even the things we buy at Subway we don't really feel comfortable calling a sandwich. This could be changing as each generation of Australian kids take up more American English speech patterns than the previous generation going back to World War II. I'm middle aged and overseas more than half the time so not guaranteed to have my finger on the pulse of Australian English. I also haven't been to the USA since 2000. As far as other English speaking countries such as the United Kingdom, New Zealand, South Africa, India, etc. I am interested to see if anybody from those places contributes an answer. The only instance of a 'hamburger' that isn't a sandwich which I can think of would be a Salsbury Steak, though a true Salsbury Steak would not have the same patty-shape of a hamburger. As many others have quoted and stated in their own answer, the definition of a sandwich comprises that of a hamburger. ...a food item consisting of one or more types of food placed on or between slices of bread, or more generally any dish wherein two or more pieces of bread serve as a container or wrapper for some other food. Do not let the fact that it is served on a bun confuse you - a bun is a type of bread. The fact that it is shaped differently does not change the fact that it is a sandwich. A Reuben, a Cuban, a BLT all can be served on a bun, and they would still be called a "sandwich". And to put the final nail in the coffin, a hamburger itself does not have to be served on a bun. 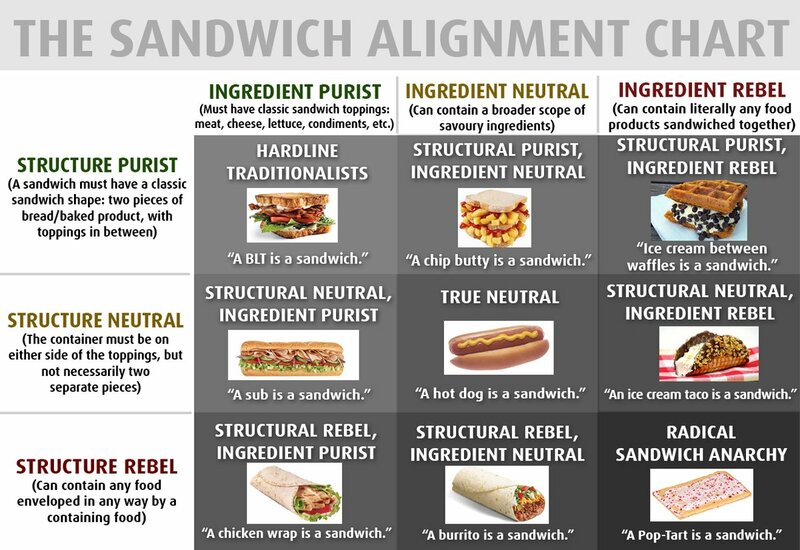 There is a more abstract meta-analysis of features to help in determining what you want the definition of sandwich to be, in order to judge if hamburger fits it analytically. For a given food preparation, there are too properties, structural and contents, and each can have three values, traditional, neutral, and exotic. Traditional means canonical. For structure, flat stuff between two flat bread pieces, for content meat, cheese, flat(tened) veggies, or spreadable such things. I can't seem to find the original source but here is one derivative. The diagram is somewhat jocular in formation but I think is still a reasonable analysis. From the diagram, I definitely don't consider a wrap, on one end, or an ice-cream sandwich on the other a sandwich. Yes in the latter the items are sandwiched and 'sandwich' is in the name, but I'd still be upset if you gave me one if I asked for a sandwich. So exotic is out for both. Now if someone gave me a hotdog when I asked for a sandwich, I'd be really confused, but I wouldn't be upset. I personally don't think of a hotdog as a sandwich even though it fits the 'lunch' situation. I don't even know what 'chip butty' means, but it looks like a sandwich. Sot, to that end of specifying a definition, I say it is structurally neutral or above, and ingredients neutral or above. By only these rule based criteria, a hamburger has traditional structure, and somewhat neutral ingredients, and so it fits the definition of sandwich. Given my conflicting answer saying that I don't consider a hamburger a sandwich, I guess there are more unspecified features that rule out hamburger from being one. This is not just a British/Colonial English vs American English issue. Most languages in the world use the British terminology for hamburger. Hàn băo in Chinese means hamburger and sān míng zhì means sandwich. If you want a chicken sandwich on a bun in China you order a "jī hàn băo" (chicken hamburger). This is regardless as to whether or not the chicken meat is reconstituted. Ordering a jī sān míng zhì will get you a different dish, probably a cold slice of chicken lunchmeat between slices of bread. Out of context Hàn by itself would mean the Chinese (people), the majority ethnic group, and băo means bread, but these words do not mean Chinese bread. They are direct carryovers of the English phonetics. On the other hand, Americans believe firmly in the idea that ground meat or a ground meat substitute equates directly to hamburger. Countries with strong American influence, like many in the caribbean, will be more likely to follow their rules in the usage. Hamburgers in America are generally served in a bun, but not always. Hamburger (without the article) can be served on top of pizza, in a salad, in a lettuce wrap, or simply naked on a plate. It's still hamburger no matter how it's dressed. Hamburgers originated in America as a dish named after the German city Hamburg. They were beef which was ground up or throughly tenderized. It was popular and people started putting them in kaiser rolls (also German/Austrian) which had been around since the 1700s. Using American terminology for hamburger would be "correct" and "authentic" in the same way as using Italian pronunciations for Italian foods and dishes. However, you don't need to be fluent in Italian to actually order Italian food. You instead need to be fluent in the local language of where you're ordering. Similarly, you should understand that there will be some differences between Colonial and American English. You'll be much better understood if you use the dialect of the person you're speaking to. Many Americans mistakenly call Japanese teppanyaki restaurants "hibachi" restaurants. Teppanyaki is "correct" and "authentic," yet so many people make the mistake the two that Japanese will often put Hibachi and Teppanyaki on their restaurant signs (even if they're only selling Teppanyaki). On the other side of the world, no one would make such a mistake in Japan. So people need to understand that local dialects will differ. There isn't always a right or wrong. There is often an authentic term of origin, but whatever is common in the area you're living in is the local standard. Confusingly, chicken fried steak is not chicken. That's for another discussion. Yes. Now eat your spinach. It is sad that with the very high quality of answers on this page, not one Popeye or Wimpy reference yet. Formally it is a hamburger sandwich. Is it acceptable to call a hot dog a sausage? Can you call a cheeseburger a hamburger?